What a scare Randy, our Jack Russell Terrorist, gave us last night. We knew it was just a matter of time before he would have an encounter with the deadly Cane Toad, or Bufo. We had gone into town to meet friends for dinner and left da boyz, Randy and Goose, in the house for a change. Now that Costa Rica is in the green season, the rains come almost every afternoon, or evening. This is the optimum time for the poisonous Bufo to come into the garden looking for bugs. 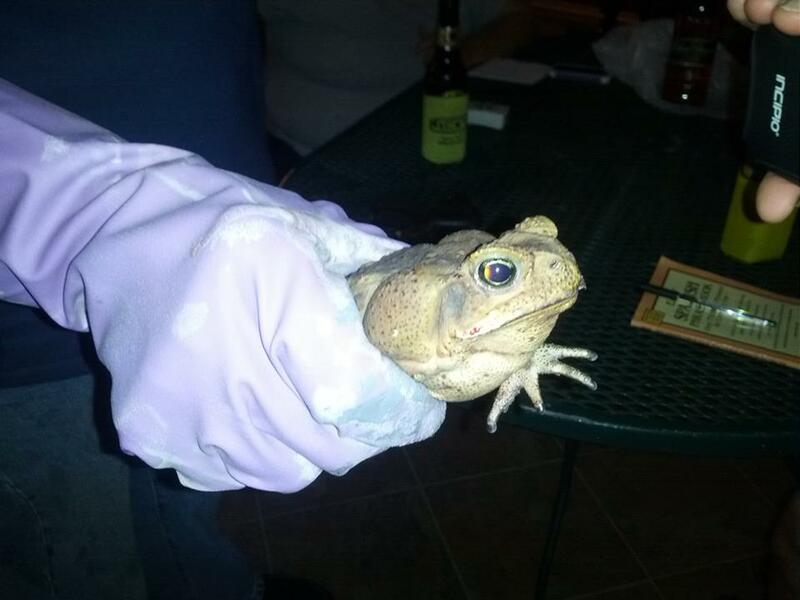 These toads are deadly poisonous to dogs and we don't want our boyz outside when there is even a remote possibility a Bufo could be in the yard. We came home around 8:30 PM and John immediately started to do his nightly Bufo patrol. I opened the kitchen door and Randy and Goose darted around me to get outside. Too late... there was no stopping Randy. He spotted a Bufo before John could get to it and his little Jack Russell brain locked into the hunt. It didn't matter how John yelled at him to stop. Randy was on a mission. John scooped Randy up, with Goose tagging along like a good boy behind, and rushed him to the sink in the utility room to start rinsing Randy's mouth before he could ingest the poison. The cane the toad produces venom from two venom glands which appear as two oval enlargements behind the eyes on the head. The glands hold a milky substances that is a neurotoxin. When ingested, it causes foaming of the mouth, paralysis, convulsions and finally cardiac arrest. This is so terrifying because all of this happens rapidly from the first onset of symptoms. We discussed the possibility of Bufo poisoning with our vet a couple of years ago and she recommend keeping Club Soda and blood pressure meds on hand in case of an emergency. I grabbed a bottle of club soda so John could start rinsing Randy's mouth and then shaved off the recommended minute amount of BP medication. By this time, Randy was shaking and his breathing was a little raspy. John had to pry Randy's mouth open so he could thoroughly rinse and towel dry the inside of his mouth and cheeks. We weren't sure if the crisis was behind us, and with no emergency vet in our little town, I called a good friend of ours that runs an animal rescue shelter to see if she could give us some advice. Frances recommended we give Randy some milk with an egg and some lemon juice and told us to bring Randy to her if he got worse. Randy lapped up most of the concoction and the shaking stopped. We are so grateful for Frances and her sage advice. We stayed up late last night, watching him until we were sure the worst of it was over. John patrolled the yard again last night for more Bufos and sent a few on a one-way, non-stop flight over our property wall. (It's important to note our neighbor property is vacant and there are no animals living there that could be hurt by a Bufo.) John found the toad Randy had bit and we were really lucky his hunting skills are not as good as they were when he was a young pup. This time Randy bit the hind quarter, avoiding the deadly poison sacs. I know John didn't get much sleep last night, he was vigilant all night, making sure Randy was on the mend. We still have several months of rainy season left this year and as soon as the sun sets we will be on Bufo Patrol everytime da boyz want to go outside and water a tree. So sorry to read this. Glad it worked out OK. Proves that we can NOT let our guard down!